January. For many, a kind of post-holiday relief, set in the wan light of short days and frigid nights. For some few others of us, this means the Sundance Film Festival, and the attendant hangers-on in Park City - the well established Slamdance, and lesser knowns NoDance and TromaDance. Whether or not we are there, we suspect something's happening that we'd hate to miss. This year, walking the edge of financial uncertainty (as in "what can I afford? "), and not wanting to spend another year at home imagining things... well, I'm playing it a bit loose, you could say. Park City is about a day's drive for me, and it hardly makes sense to fly out and rent a car for ten days, so I packed up clothes, gadgets, and snacks, woke up with the alarm, and spun out of the driveway with all cylinders blazing. 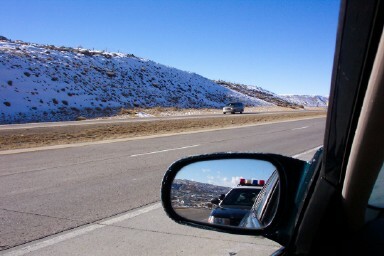 Again, Wyoming's finest were ready to greet me with a warm welcome. $200 later, I think it's still cheaper than flying out, but it's a closer call than I expected. I'm not sure how the state boundary here was drawn, but at least for I-80, there is a definite change to the geography - transitioning from the barren rolling plains of Wyoming to twisting through some real mountainous terrain. Some eight or so hours of driving brings me to Salt Lake City. Really, I come here today for two things - to visit the local offices of a company I sometimes work for, and for a cheap hotel room. Tomorrow I get to camp out for last minute tickets at Abravanel Hall here in town for Sundance opening night. What can I say about Salt Lake City? There's something here that causes the people to direct their energy into architecture. Perhaps it's the good old Mormon work ethic. Or maybe the restrictive vice laws leaves certain energies in the people that has to be released somehow. However this happened, it does make for nice scenery, particularly at night. I'll put up some pictures, once I find the proper settings on this digital camera. And lest you think I'm not going to actually mention any movies here, let me just mention that tomorrow's opening night premiere is Levity, starring Billy Bob Thornton as a convict just being released from prison - a topic I find oddly compelling. Also starring are Morgan Freeman, Holly Hunter, and one of my favorites, Kirsten Dunst. The buzz is pretty significant on this one, which may or may not mean anything. Perhaps Levity will perform better than the opener I saw two years ago, My First Mister - a film I liked, but didn't really find its audience. Turn in tomorrow to find out my own thoughts on this picture.